"Can I Still Do That? - Thoughts On Self Assessment"
“We are all legends in our own minds.” Most legends seem to have some basis in fact. That is true with our perceived skill levels. There is some basis in fact. However, is our perception a reality? As a result of a recent stream of club e-mails, a recent tragic event and a search and rescue on Santa Cruz Island (California) I thought I would like to address the issue of knowing our own skill levels. In order to do justice to this subject one should have a good understanding of what I call the “Transient Nature of Skills” (USK article May 2007). In brief, the skills you demonstrate today can change from day to day depending on a number of factors. The point of this article is looking at the accuracy of self-assessment regarding our skills. How do we know when we have achieved a particular skill? The answer is simple. When you try the skill and perform it correctly then you have achieved the skill (under those conditions on that day.) When do we know when we cannot perform the skill? When you are faced with the need to perform and you cannot do the skill, then you know that you no longer have the skill at that moment in those conditions. The problem is we don’t want to find ourselves in conditions with serious consequences and realize we have lost our skill. As we get older our bodies change and so does our psychological make-up. With some skills we know we are probably loosing our edge without even testing them. We also may not be as daring as we were when we were younger. I believe we have a built in safety net that works most of the time, but not all the time. 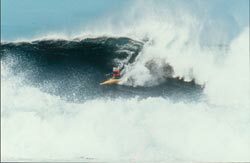 In 1991 I was competing in the world championships (In Thurso Scotland) as part of the US Surf Kayaking Team. I must say I was at the top of my game regarding my surf kayaking skills. I won the bronze medal in the “Hot Dog” event. The waves were big, the water was cold and the waves were breaking on a tiered rock shelf. On the wave you see me riding, one of my team mates couldn’t get over the wave in time and it broke his kayak in half under the seat. The kayak folded with Mark inside and luckily without injury. The kayak was a durable roto-molded plastic boat. In 1991 I was a hot dog. Today I feel like an overweight Polish Sausage. While I can still feel myself back on that wave when I look at the picture, I know I would not get on that wave again until I tried to get my skill level back (if I could.) It is obvious to me that I am no longer at my peak for extreme wave riding. If the last time you performed a self-recovery was two to three years ago I would be hesitant to rely on it in a real situation until I tried it again in a practice situation. Unfortunately this may have been the cause of a recent loss in our kayak community during a solo paddle. Again, when do we know our skills no longer work? I wish I could give a perfect timetable for how often one should practice. It doesn’t exist, because we are all different. I would feel comfortable to say that skills should be practiced, at the longest, every three months. Of course, the more often you practice the better barometer you have of your skill level. Longer than three months may occur during the winter season, so I suggest you have a practice session at the beginning of the paddling season to see if you still have it. If you don’t, try to get it back. At the end of the season it would be wise to have a “shut down” practice session to enforce the skills before the off-season rest period. I think the best way to train is adopting the "Capsize Every Trip" philosophy. Since we are usually practicing our strokes while paddling, we need to spend some time maintaining our capsize recovery skills. I have yet to read "poor strokes" as the cause on a death certificate. If you cannot get into your kayak and/or you are dressed improperly, then you have a problem. When you are approaching shore and the water is still deep enough not to touch bottom, try some wet skills. Practice bracing until capsizing and then practice a recovery. You will find out if your skills are working and if your clothing choice was correct. If you can roll, try rolling. After a successful roll, try it again and miss it on purpose. Then set up for a second try. It is good to practice second and third set ups to condition yourself in case you miss a roll when you really need it. Imagine how much more reliable your capsize recovery skills be if you were to do this every time you go out. If you are getting rusty you will get immediate feedback. Be sure to alternate which recoveries (solo and assisted) you practice. If you can try two or more the same day, all the better, because you will be adding a fatigue factor into your training. If it doesn't go well or if you are getting cold, you are right near shore to get out and warm up with the clothes you have ready in the car at take-out. One of the positive aspects of certification is you are being assessed by another who is supposed to be a professional. They are trained to give you feedback as to your skill level. It is good to get outside feedback on your skills. I just tried out a new ballast system in my kayak and I had Hadley video tape me, as I performed certain maneuvering skills and some rolls, so I could review it from the outside perspective rather than how it felt. I must also add that a false sense of security can result from certification, because your skill rating was on that given day in those conditions based upon the individual assessing you. If you don’t practice to maintain those skills, then the certification means you were once at that level. A good instructional program should include judging your skills and the conditions that are appropriate to your skill level. There is another element of self-assessment that I will not go into in great depth. The recent search and rescue that occurred on Santa Cruz Island was a result of “ignorance is bliss.” The group’s self-assessment was so far from reality, because they just didn’t know what they needed to know. That is another good reason for continuing education (classes, books, videos, club e-mails, practice sessions, etc.) Making an educated decision means you are educated in what needs to be considered. In closing, I encourage all of you to try to keep the legends in your mind closer to reality than legend.